I recently enjoyed this wonderful Brazilian drink, Limonada Suiça, at one of my favourite breakfast/brunch places in Amsterdam. It’s very easy to make and it’s incredibly refreshing on a warm summer day. You do need a solid blender that’s up to the task as you’re blending a whole lime (preferable organic) skin and all. By using the whole lime, including its peel, you are benefiting from all the lime’s nutritional benefits. Most of the vitamin C is found, not in the juice, but in the peel. When juicing I often use the peel of citrus fruits. The peel adds a lovely bitterness to the juice. In this lemonade, the bitterness from the lime peel makes the lemonade far more interesting. I am not a big fan of sweet lemonades but I love the distinctive bitter flavour of Limonada Suiça. It tastes just like a really good tonic water, not to sweet and very refreshing. In this recipe, I have used coconut nectar instead of sugar cane sugar or syrup. You can keep it simple (which is pretty awesome too) or spice it up by adding fresh mint and/or coconut milk. I love the subtle coconut flavour but you can easily make it without. You choose! 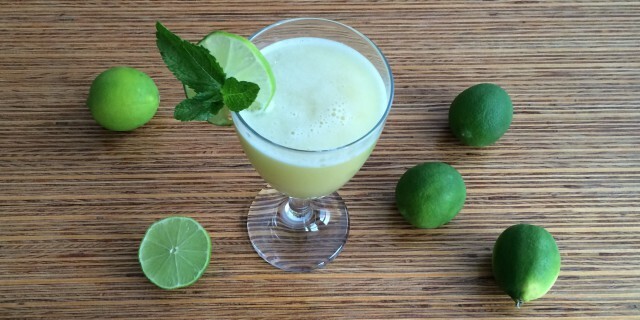 I like to add fresh mint because I think the combination of fresh mint and lime is to die for. Add all ingredients to a high-speed blender. Pulse until smooth. Drain and serve right away!